In a concurrent body of work Terry Young reveals a lone, anonymous figure of protest in a charged environment, whose face was obscured by a large, hand-held sign with text often referencing a societal injustice. By creating such moments of openness that happen when structural principles of society are called into question, Young seemed engaged in an attempt to enact and affect social change through his work. In lieu of these images that isolated a character, Young’s recent pieces juxtapose multiple elements in a single framed view. They present patterned veils over scenes; these foregrounds suggesting coded subtitles rising from Young’s sensibilities to inform the settings. By embodying the touch of the artist, these works invite viewers to imagine a tactile encounter with what’s on their surfaces. They make the veils seem close while intimating a sense of great space, emphasizing the materiality, the physical properties of scenes. One’s gaze sinks into depths of landscapes, then keeps being brought back to their mesmerizing, textured surfaces. These works seem to suggest parallels to our desired understanding of the other, be it an individual, society, or nature itself; something tangible emerges that we think is knowable, yet something mysterious lies perpetually out of reach. Terry K. Young II was born and raised in Pittsburgh, Pennsylvania. He received his B.F.A. from Carnegie Mellon University and his Masters from Goldsmiths College in London. 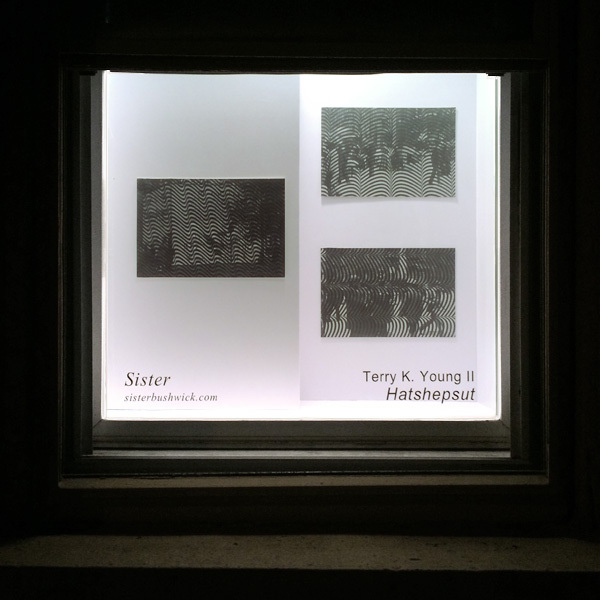 Working primarily as a printmaker, Terry is also the founding member of The Appalachian School, an interdisciplinary arts organization which brings together international artists through collaborations and exhibitions.